We may have left the wizarding world (of the books) behind many years ago, but Harry Potter and his first Quidditch match is still as fresh in our mind as dew on grass on a chilly morning. It was yet another day at the Hogwarts school but if you, a muggle, wants to glide on the Nimbus 2000 broom and relive that gripping moment for yourself then it’s now possible. Snapchat has decide to celebrate the birthday of the wizarding world’s boy wonder, Harry Potter, in the best way possible. 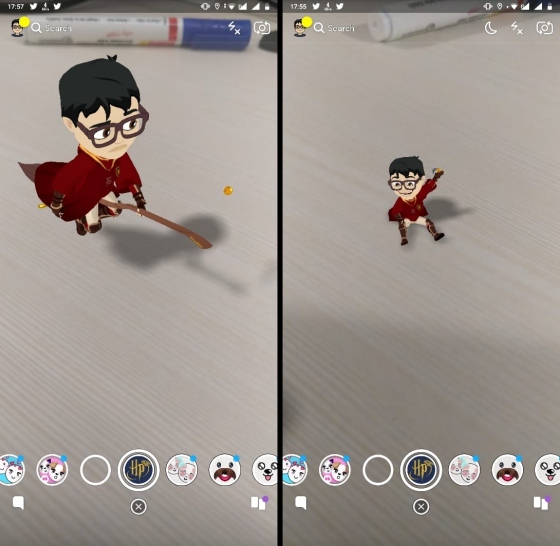 With the latest update, Snapchat has added new 3D Harry Potter Bitmoji Lens to let you become a part of any of the four Hogwarts houses and play the most-popular sport – Quidditch – in augmented reality. As you can see above, it is really simple to fly around on a magical broom and catch the golden snitch for muggles. You only need to open Snapchat, point the camera to where you want to fly, and long press the screen to activate the Harry Potter world lens. Once you follow through with these steps, you will be able to see your Bitmoji avatar in Gryffindor robes flying around on your screen trying to catch the snitch just like in the movies. If you are not the biggest fan of Gryffindor, then don’t worry, as you can customize your appearance in just a few taps. This may not be the most engaging experience that Harry Potter fans are looking for, but this augmented reality (AR) lens from Snapchat is a fun way to dial back the nostalgia to the early 90s.